I was looking through what beers are around the house last night and came across one more pumpkin beer that needs to be consumed. So without further ado, let's do it. BTW, if you live near the Total Wine in Pembroke Pines, FL, and if you love pumpkin beers, they still have a few desperate Weyerbacher Imperial Pumpkin Ale 4 packs basically for the asking. They are on the shelf of misfit must-go beers! So here I am with my Pumpkinhead Ale brewed by Shipyard Brewing Company in Portland, Maine. Best enjoyed before February, 2010. There is a little cinnamon and other spices for an aroma, very weak. Flavors start out malty, with faint nutmeg. Very watery, very light. The medium carbonation is the best part of this beer. That's it! There is nothing else to say about this except you finish dry. 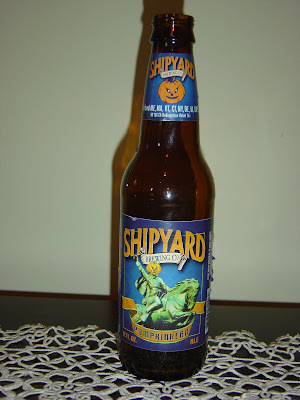 I was looking back at other beers I've reviewed from Shipyard. Memory was right on! I have not had a beer yet that I liked from them. And mostly they were terrible, just like this one! Please remind me to skip this brewery without a stellar recommendation. I am not a normal fan of pumpkin beers but I enjoyed this one. I picked up quite a deal of ginger bread in the taste of it as well. Another of our fellow S. FL beer loving friends told me she likes this pumpkin beer the best because it tasted the least like overspiced pumpkin pie. Yeah I don't like the pumpkin beers that taste too much like....well pumpkin. I, like you, seem to not remember that I didn't enjoy the last Shipyard that much and I buy others. However I can say that I tried their Smashed Pumpkin and it was quite enjoyable . . . much better than the Pumpkinhead. I'm glad pumpkin beer season is over until the fall. I'll have a few more then, maybe even Smashed Pumpkin.